Epic Curb Carnage This Spring! Or Is It Just Me? | Sack-Vegas!!!! 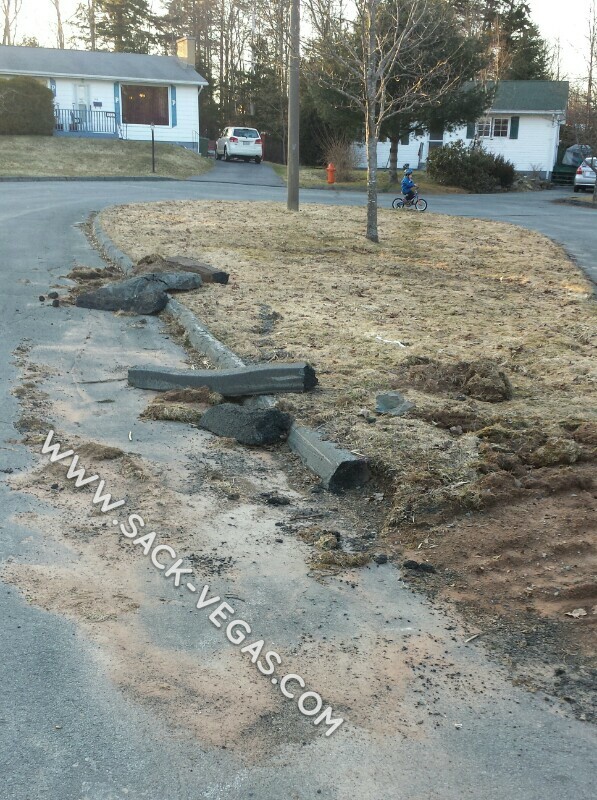 Epic Curb Carnage This Spring! Or Is It Just Me? I think the picture speaks for itself. I can take a spin around Sackville and take dozens of similar ones. I understand this happens during road clearing but it seems really bad this year. 1) Is the contractor involved held accountable for messes like this? 2) Do any of the same contractors do curb repairs and could possibly benefit from this? 3) Are the costs of the repairs part of snow removal budget? They should be, IMO. Anyway, I know pressure is on to get the roads cleared quickly but the aftermath this year is brutal. Have any pics that can beat this one? Send them to Jeffn186@hotmail.com and I’ll post ’em up! Posted by Sacky on April 11, 2014 in Burning questions!.